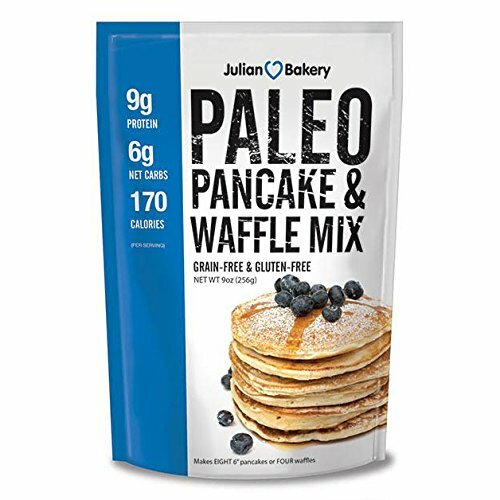 Paleo Pancake & Waffle Mix (Low Carb & Gluten Free) by Julian Bakery at Good Time Donuts. MPN: JUB00251. Hurry! Limited time offer. Offer valid only while supplies last. Easy to make Gluten Free, Grain Free, Paleo Waffle or Pancake mix. Simply mix bag with water and coconut oil or grass fed butter (Primal option). Easy to make Gluten Free, Grain Free, Paleo Waffle or Pancake mix. Simply mix bag with water and coconut oil or grass fed butter (Primal option). Ingredients: Almond Flour, Dried Egg Whites, Vanilla Extract (Pure & Unsweetened), Potassium Bicarbonate, Stevia, Cinnamon, and Sea Salt. Grain Free, GMO Free, and Delicious! If you have any questions about this product by Julian Bakery, contact us by completing and submitting the form below. If you are looking for a specif part number, please include it with your message. Good Dee's Double Chocolate Chip Cookie Mix - Low-carb, Sugar-free, Gluten-free, Grain-free, 2 Net Carbs! Good Dee's Chocolate Chip Cookie Mix - Low-carb, Sugar-free, Gluten-free!